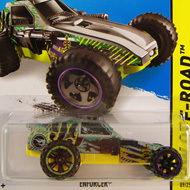 113/250 is part of the HW Off-Road series and the 2015 Treasure Hunt set. The yellow powerboat features black & orange graphics, “adlar 58 racing”, “64”, and the low production symbol in black. 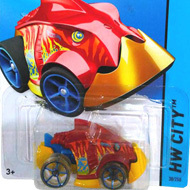 It has a black window, a chrome engine, chrome Open-Hole 5-spoke wheels with translucent blue tires, and a translucent blue Malaysia base. 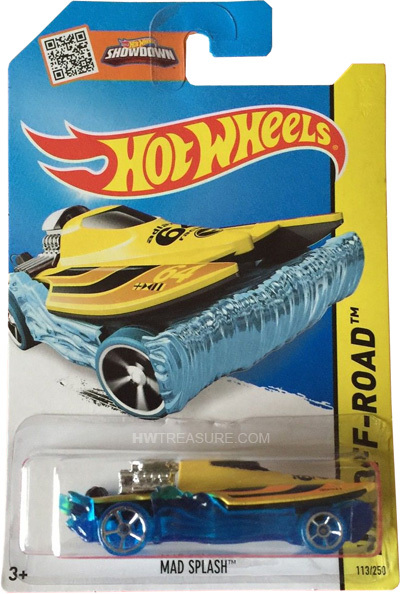 This vehicle can be found in mix “K” of 2015 Hot Wheels mainline cases. The Mad Splash made its debut in the 2012 New Models series. It is a unique design that looks like a racing catamaran floating on a bed of water.